Three lost ships that were on a quest for the Northwest Passage, a sea route over the Northern end of the North American continent have recently been in the news. Canadian underwater archaeologists located the HMS Investigator, a ship sent in 1853 by the British to search for two other lost ships, the HMS Erebus and Terror that went missing with their crews when Captain Sir John Franklin set off on his expedition in 1845. The Canadian team said the Investigator, which was left abandoned in ice by its crew, was found in shallow water in Mercy Bay on the northern coast of Banks Island in the Western Arctic. Marc-Andre Bernier, Parks Canada’s head of underwater archaeology, said the ship rests upright in 36 feet of water and remains in very good condition. After years of searching the remains of both the Erebus and Terror have also recently been discovered, along with the frozen remains of some of the 128 crew members who perished on the expedition. The Erebus was found in September, 2014 by a Parks Canada team. The identity of the wreck was determined by Parks Canada and Royal Canadian Navy divers the following year. In 2016 the Arctic Research Foundation found the HMS Terror in 80 feet of water resting on the sea bed off King William Island. Researchers say this ship appears to be in pristine condition, with most of its windowpanes still in place. This wreck was located after an Inuit reported spotting a mast jutting through the ice while he was on a fishing trip. All three wrecks are now designated a National Historic Site of Canada. 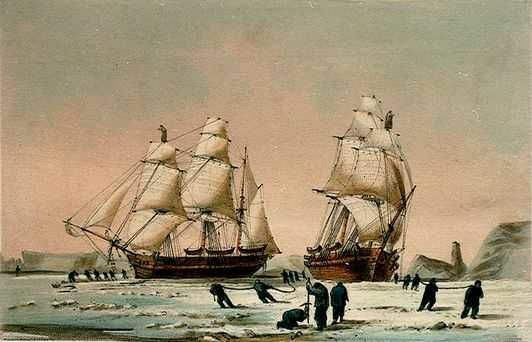 The horror of the Franklin research expedition is focused on the discovery of the remains of crew members that have been turning up in the ice over the years since these vessels went missing. That some of the bones were found sawed off gives strong evidence that the men resorted to cannibalism during their long struggle for survival. More than 30 search and rescue missions were conducted after Franklin’s expedition first went missing. At first only scraps of evidence, personal articles like clothing, forks and spoons and a shoe, were found. A melt-down of ice caused by a warming Earth may have helped in the recent discoveries of the missing vessels and their crews. Franklin was lured into making the voyage by the Royal Navy’s offer of a 10,000 pound reward for finding the legendary Northwest Passage. The reason for the search was financial. Such a route would give ships a shortcut around the Americas on voyages to the West Coast and Asia. Iron plates were installed on the bows of both the Erebus and Terror and both vessels, although designed as sailing ships, had steam engines installed. Franklin, no stranger to Arctic expeditions, had already mapped 1,200 miles of the Canadian northern coastline. He was using the latest technology of his time to try to break through the ice and find the long sought passage. It has long been believed that something terrible happened to all 128 members of the expedition crew. Stories were told by the Inuits to researchers on early rescue missions that members of the crew were behaving strangely. They were said to have been acting crazed and desperate, and some were resorting to cannibalism. The stories led to theories that the Franklin crew became trapped in the ice and either suffered from lead poisoning from poorly packaged food, scurvy, or they just ran out of food. There were no survivors. To this day nobody knows what really happened. The Northwest Passage exists. While icebound for much of the year, modern ships now are making the trip with the help of an icebreaker. Ports of call along the route include Pond Inlet, Resolute and Cambridge Bay. Ironically, the passage was discovered by Captain Robert McClure in 1855 during one of the many searches for the Franklin crew. It involves a winding, twisting route among a cluster of islands. While his own ship was trapped in ice, McClure set off by sledge and discovered a passage between Banks Island and Victoria Island, leading from west to east, which linked up with all of the other known waterways in the Arctic region. He won the prize money for his discovery. While it was known to exist, it was another 50 years before a vessel successfully sailed through the passage. Norway explorer Roald Amundsen and his six-member crew successfully brought a 47-ton fishing boat Gjoa through the passage in 1905.